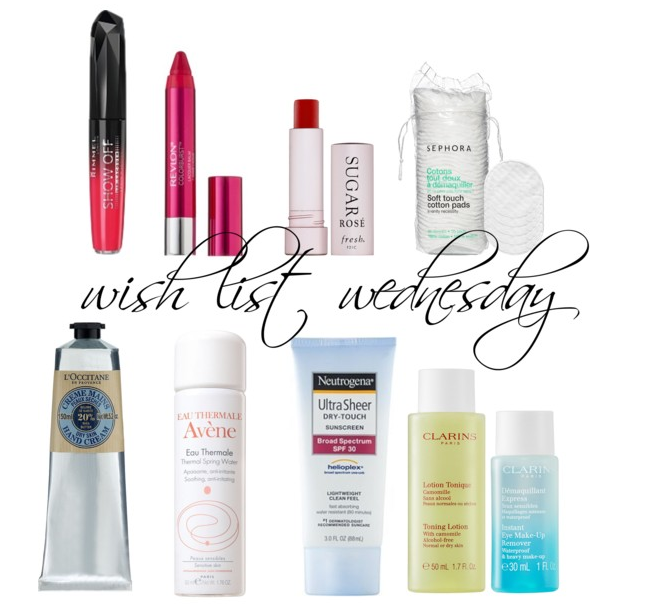 part 2 of the travel wish lists is skin-care/beauty-centered. anticipating the warm, tropical weather has me itching for cheery pink lips. the trifecta of a (liquid) lipstick, a lip pencil, and a lip balm in a range of pink shades should do the trick. both products in the clarins duo work well, especially the eye makeup remover (it takes everything off), and the travel size makes them a no-brainer addition to my itty-bitty carry-on pouch. cotton pads can come from anywhere, but I want these sephora ones because of the little plastic bag that makes carrying the perfect amount easy. I intend on reusing it for all my future trips. you can’t go to the tropics without sunscreen. neutrogena makes the best ones – no icky, greasy feeling and a light scent. and two bits essential for the looong plane rides: hand cream and spray water. my holy grail hand cream is l’occitane (I’m partial to the almond and shea butter scents). as for spray water, I’ve tried a couple of brands, but I’m going with avene this time around. I actually have the full-size version at home and was delighted to find that it comes in a carry-on approved size. a little spritz on the face every couple of hours on long trips feels amazing and it’s one of the things that I rely on to make me look presentable when I deplane. it’s the next best thing to a shower after a long trip.